The Ford Expedition has been a staple in Ford’s lineup since it was introduced back in 1996. The full-size SUV replaced Ford’s Bronco, and is currently Ford’s only truck-based off-road and tow-capable full-size SUV. America’s favorite SUV also shares the same transmission, electronics, towing features, and chassis controls systems as the Ford F-150, making it a close relative to the pickup. The Ford Expedition is a true American-made car. Produced in Wayne, Michigan until 2009, the SUV is now manufactured in Louisville, Kentucky. The 2015 Ford Expedition is a refreshed version of the full-size SUV, and likely the last year in the third generation model of the vehicle. The Expedition features a refreshed interior, exterior, and has distinct revisions under the hood. Ford also offers drivers the choice of it’s all-new Platinum Grade Expedition, putting a new name and expectation on luxury. One of the most considerable changes for 2015 includes the all-new EcoBoost engine that comes standard on the Expedition, making it more powerful and efficient than past models. 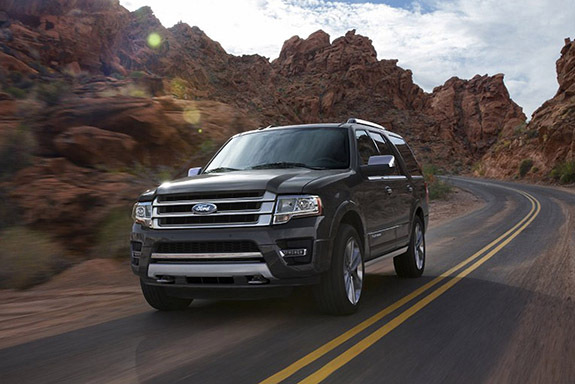 The 2015 Ford Expedition is an American-made, powerful, SUV that stands up to the competition in every possible way. When Ford designed the 2015 Expedition, not a lot of major changes were needed. The SUV had stood out as a popular choice in its segment, so altering the formula for the Expedition was not necessary. Instead, Ford chose to make minor exterior changes that included: squintier headlamps, rearranged front bumper, new grille, new wheels, a redesigned liftgate, new tailpipes, and LED fog lights. The 2015 Expedition is still similar in appearance to other model years, but makes a bold new stance with those extra added features. 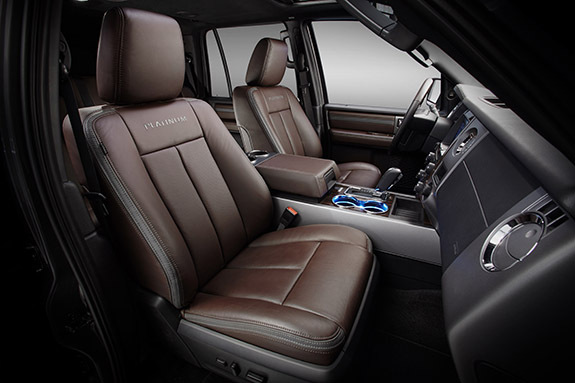 Interior changes for the 2015 Expedition are also minor, but are welcome alterations to the seemingly outdated cabin. The 2015 model year features an updated instrument cluster, keyless access, remote start, blind-spot monitor, a rearview camera, ambient lighting, Sony sound system, Ford’s Truck Apps, center stack with SYNC and MyFord Touch, and an all-new steering wheel. The 2015 Ford Expedition receives the minor updates needed to keep up with current in-vehicle technology, all while maintaining it’s iconic style, design, and presence on the American roadway. When Ford engineers designed the new Expedition for 2015, they made an unpopular decision. Nixing the previous standard 5.4-liter V8 engine, in favor of a 3.5-liter V6 option. At first glance, the decision doesn’t seem to make sense. The smaller V6 engine appears to be less powerful with a lackluster performance, but the opposite is actually true. Thanks to Ford’s EcoBoost technology, the standard 3.5-liter twin-turbocharged V6 is more powerful, and offers a better performance than the outgoing engine. Featuring the highest standard horsepower on the Expedition than ever before, the new EcoBoost engine boasts 365 horsepower, with 420 lb.-ft. of torque. Not only is that impressive, it’s also the best-in-class performance-wise. Along with this increase in performance, Ford engineers also managed to deliver a higher EPA-estimated fuel economy than previous model years. The full-size SUV can manage 22 miles per gallon on the highway, which outperforms most of the competition. The outgoing standard 5.4-liter V8 engine on the 2014 Expedition topped out at 355 horsepower, and 383 lb.-ft. of torque. Aside from being less powerful, this outdated engine could only achieve an EPA-estimated 20 miles per gallon on the highway. The advanced direct injection also helps to maximize every ounce of power from each drop of gasoline, and the air-to-air intercooled turbochargers also work to provide instant on-demand power. No other engine is available on any other full-size SUV that even comes close to what Ford offers on the 2015 Expedition. When style, luxury, and comfort are important, the all-new Expedition Platinum model delivers. Drivers will not be disappointed with this well-equipped top-of-the-line 2015 Expedition. This all-new trim level stands up to the competition with more standard and available features, along with an overall feeling of luxury typically reserved for high-end automotive brands, with high-end price tags. So, what is it about the all-new 2015 Platinum Expedition that leaves drivers and passengers with their jaws on the floor? Check out everything it comes with below. Nine cupholders and illuminated entry lighting are just the tip of the luxury-comfort iceberg on the Platinum Expedition. The interior exudes a comfortable luxury that is sure to withstand even the longest of road trips, while the exterior gives off a bold on-road presence that is both eye-catching, and impressive. With the standard 3.5-liter EcoBoost V6 engine and six-speed SelectShift automatic transmission, this Expedition packs in both power and performance. A few of the highlight performance features include integrated trailer brake controller, traction control, AdvanceTrac with Roll Stability Control, EPAS rack-and-pinion steering, and an independent rear suspension. One of the most important aspects of any vehicle, the 2015 Platinum Expedition delivers on the most up-to-date advanced safety technology. With dual-stage front airbags, safety canopy system, SOS Crash Alert System, and Forward/Reverse sensing systems, this model is ready for any situation that it encounters.